Werewolves are shapeshifters, but not all shapeshifters are werewolves. 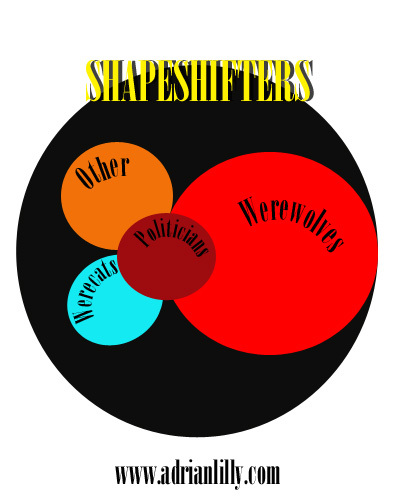 Shapeshifters is a larger category with other types of transforming creatures within it. (See chart). To show that I am an equal opportunity shifter lover, I am taking this opportunityto bring you a list of shapeshifter movies that are not werewolves as a part of the weekly phenomenon known as #WerewolfWednesday. Clas-sick. Really. Everyone should see this movie of a monster that can take on the shape of any living creature. Not to write a spoiler, but they’re people who turn into cats. This one is different… and inspired by Native American legend. A variation on The Thing and fairly good in its own right. Bonus points for being underwater. What can I say? Everyone’s already seen this. Some cars are better than others. She’s a lady. And she’s a hawk. A beast is inside, but it’s not a werewolf, it’s…something else. Just what is the monster in this movie? Guess we’ll never know. I loved the twist in this movie. This was actually much better than I expected going in. If I missed a favorite non-werewolf shapeshifter movie of yours, please feel free to add it in the comments! Just when you thought it was safe to go into the woods… #WerewolfWednesday isn’t only about werewolves. Looking for a movie I saw that people told me did not exist. About a family a man and his two children. One boy one girl . Father took them on vacation to this small town for vacation but he could not stop working. Next door to there cottage was a old Indian in a wheel chair that friended them in to a story about a creature that lived in the lake like lossless the Indian would have the kids take him to the beach so he could be close to the creature. He told them the creature was over 900 years old and he would join it when he figured out how to shift change . Some men at a chemical factory started dumping full barrows of chemical into the lake and one came open. The old Indian felt the pain of the creature. And knew it was firing. They found broken rusted out barrels with stuff coming from them . But them and the Indian needed to prove the chemical.was being dumped and effecting the creature and wildlife in the water before the creature dies. Hmmm. Not sure but two movies come to mind Prophecy (1979) and Mutant (1980). I haven’t seen either one in a loooong time, but they could be it. Happy hunting! In the movie the kids prove the chemical was being dumped with the help of the monster. But it seemed too late for the monster had not been seen for awhile. The movie ends with the return of the monster and the disappearance of the old Indian. When his vacant wheel chair of found at the beach of the lake . As if he finally did what he wanted to do but too late to help the other monster. I remember the name of the movie was the name of the town. Was not a scary movie at all but one that related a truth. That’s why it’s in my head still to say about 20 to 30. Years ago. That’s Magic in the Water (1995)! Loved that movie as a kid!